blog.HalloweenAdventure.com | Latest News from the Costumes Trend FrontLines! : Who needs history class when you have historical costumes? Who needs history class when you have historical costumes? This Halloween, help your boy learn his history lessons in a way that’s a little bit more fun! Teach him about his ancestors, the ones who started the good old US of A, with our Colonial Boy Historical Costume. 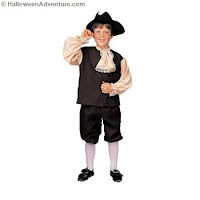 Our colonial boy costume includes the tricorn hat, jabot, pants, and vest with sleeves. Costume is brown with beige sleeves and beige jabot and a black tri-corn hat. Go back to the gangsters of the fifties with our Greaser Youth Costume. Includes black vinyl, zip-up jacket with black polyester pants and sunglasses. Goes great with a Sandy costume! Ride em, cowboy! Take him back to the Wild Wild West with our Gun Slinger Cowboy Costume. Tell him all about the men who hunted their own game and dug for gold! Costume includes suede fringed pants and suede vest. We recommend pairing the with a flannel shirt to complete the look. For more historical costumes for boys, check out our historical costumes section at Halloween Adventure. Remember, the best costumes sell out early, so hurry up and get yours today!